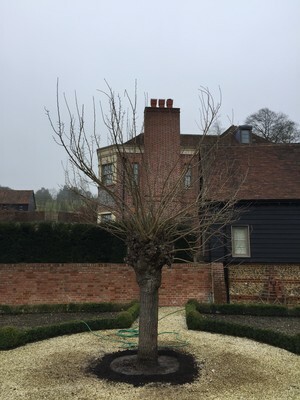 The client brief was to find a broadleaf spreading feature tree that one could sit beneath and that would provide shade in the vegetable garden parterre. After much searching I landed upon an old white Mulberry pollard. The tree has a girth of 120cm giving an air of maturity with the added bonus of fruit which links it in to the ultimate purpose of the kitchen parterre. 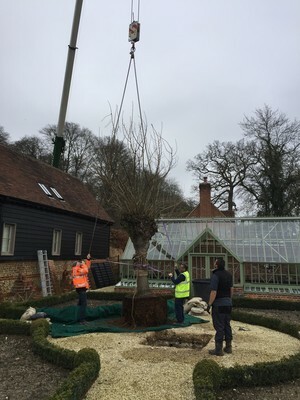 The tree weighs 1.6 tonnes and had to be lifted from the front of the house to the rear over a newly installed glass house. The tree had travelled some distance coming from Northern Italy to the Oxfordshire area. Now in place the tree gives an air of maturity in to a relativity new space and provides an interesting strong visual element in to the garden and the outlying areas.